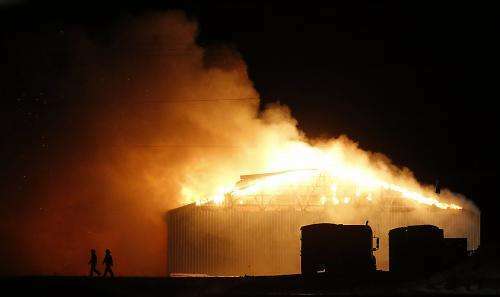 Firefighters battle a Nov. 19, 2014, blaze at a grain elevator in Mitchell, South Dakota, from the outside to prevent exposure to chemicals. The building, which is owned by CHS Farmers Alliance, contained farm chemicals and fertilizer. The diagnostic test to determine cyanide exposure takes 24 hours. According to U.S. Department of Health recommendations, "any delay to draw blood or collect urine could endanger patient welfare." That's why medical personnel simply treat the patient when dealing with a possible case of cyanide poisoning. 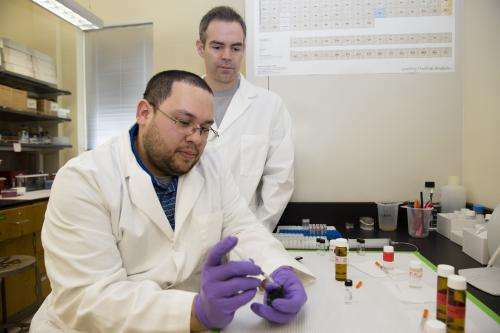 Associate professor Brian Logue of the South Dakota State University chemistry and biochemistry department has a solution—a prototype that can detect exposure to cyanide within 70 seconds. Through funding from the Department of Defense and National Institutes of Health, Logue has been analyzing cyanide and its metabolites to help create countermeasures for cyanide exposure. When an industrial fire occurs, workers and firefighters can be exposed to cyanide, according to Logue. Scientists and medical personal need a quick, reliable and portable means of identifying exposure to cyanide, Logue explained, which prompted the NIH's request for proposals. Early symptoms of cyanide poisoning include dizziness, headache, shortness of breath and rapid heart rate as well as nausea and vomiting, according to the Centers for Disease Control and Prevention. South Dakota State University associate professor Brian Logue, right, watches as postdoctoral researcher Randy Jackson fills the wells in the cyanide sensor cartridge with chemical reagents—an acid, a base and a fluorescent agent. Each cartridge can determine the cyanide level in a sample of either blood or water. "A lot of these symptoms are pretty nondescript," Logue pointed out. "That's another part of the reason for the sensor." The patent-pending sensor design uses a two-stage process—the first converts the cyanide in the sample into a gas and the second traps it in a base. "It diffuses like perfume," Logue said. The cyanide then reacts with a second substance and becomes fluorescent when exposed to light, according to postdoctoral researcher Randy Jackson. The fluorescent product containing cyanide then emits its own light which can be measured to determine analytical concentration. Though diagnostic time has decreased from 2 minutes to 70 seconds, Logue pointed out, "we haven't optimized it—we'd like that to be under a minute." In an emergency scenario, a blood sample from a finger prick, like a diabetic would do to measure blood sugar, could be used to determine if a person has been exposed to cyanide, Jackson explained. Jackson places the blood sample on a swab inside the cartridge, that is then inserted into the sensor device for analysis. Ultimately, the researchers would like to be able to test saliva, because typically cyanide exposure occurs through the mouth or nose, Logue explained. However, thus far a consistent link between the two has not been established. Tests performed on rabbits were 100 percent accurate at diagnosing exposure to cyanide, even at levels 200 times lower than the lethal amount, Logue explained. The device detects cyanide levels below what a person is exposed to when smoking a cigarette. Logue plans on conducting larger animal studies to statistically determine sensor accuracy. "We're pretty confident the device is accurate diagnostically because the specificity of the reaction is very good." 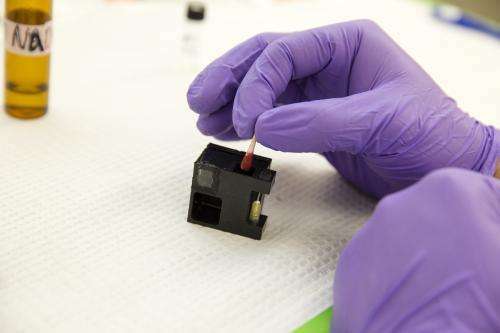 In addition, the researchers will tap engineering expertise to miniaturize the device and will optimize the replaceable cartridge that contains the reactive chemicals. Eventually, the device must be approved by Federal Drug Administration. Refining and getting this device to market is Logue's mission: "I want to get this product to the people to help save lives."